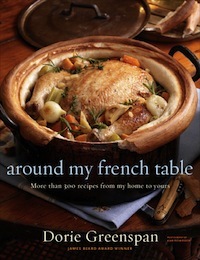 I've joined a new online cooking group: French Fridays with Dorie. Created by the people behind Tuesdays with Dorie (a baking group), these bloggers are cooking their way through Dorie Greenspan's new cookbook Around My French Table. I made quite a few of the TWD recipes from March 2008-December 2009. I joined the group to force myself to learn baking skills, which I did. After nearly 2 years of making weekly desserts, though, I had just had to stop. That was simply too much sweet stuff. Recently, though, I've found myself with all kinds of cooking plans that I never follow-through with. I figured that having a weekly cooking project would be a good idea to get motivated. Though, I still may not complete each week's recipe, my goal is to try at least two every month. The rules for this group are simple: Make the chosen recipe each week, post on Fridays, but don't publish the recipe. Also, there is no minimum posting requirement...which is nice as I was eventually "kicked out" of the TWD group for not posting. 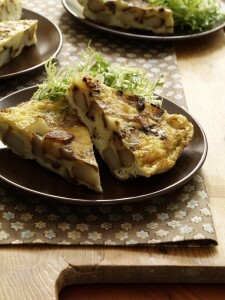 This week's recipe is for Basque Potato Tortilla, which I've been referring to as a "potato quiche." It's more like a frittata than a quiche, though, and it's easy to make...brown potatoes & onions with garlic & rosemary, combine with beaten eggs, cook slowly without stirring in a cast-iron skillet until set, finish under the broiler. Meant to be served at room temperature, this is a popular Spanish hors d'oeuvre (often served in bite-sized pieces on toothpicks) served in the Basque region of France, according to Dorie. I ate it warm for dinner with a side of braised kale with garlic & lemon. Jerad ate a few cold slices for breakfast the next day with a side of ketchup (Ahh, Jerseyville).